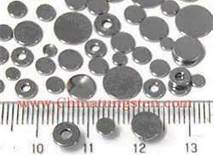 Tungsten contacts are for use in high voltage applications, usually where highly repetitive switching is required. Tungsten has a melting temperature of 3,380oC which gives it excellent arc-erosion resistance.Tungsten may develop troublesome oxide films, especially when used as the anode contact in some DC applications. Therefore, tungsten is often used as the cathode contact, and a palladium alloy used as the anode contact. Such a combination also minimizes contact interface resistance and material transfer. Tungstsen contacts are widely used electrical appliances such as automobiles, motocycles,electric horns,magnetic-motors etc. For more details about tungsten contact, you can contact by telephone 86 592 5129696, or email to sales@chinatungsten.com sales@chinatungsten.com . Any enquiry or questions will be warmly welcomed.